University of Nottingham > Blogs > (Un)trenched Opinions > Buildings > Remember Remember the Fifth of November! A team of researchers from The University of Nottingham has recently been doing new work at one of the most important places associated with the Gunpowder Plot of 1605. Following the English Reformation, English Catholics were forced to make difficult choices between their loyalty to the crown and their faith. Catholic families across the England’s West Midlands have redesigned their country homes to include secret spaces known as ‘priest holes’. Ingeniously concealed in walls and under floors, these secreted chambers were built to hide Catholic priests to prevent them being found by Protestant Royal search parties and executed as traitors. Coughton Court in Warwickshire sits at the heart of this group of Catholic country houses. Now in the care of The National Trust, since the fifteenth century it has been the home of the Throckmortons, one of England’s oldest Catholic families. First discovered in the 1850s, still with a rope ladder, some bedding and a portable altar, the Coughton priest-hole was hidden in a turret of the main gatehouse, concealed between the floor levels. 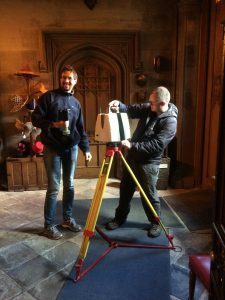 Laser scanning the gatehouse – Sean Ince and Lukasz Bonenberg. And the Gunpowder Plot connection? Well, in 1605 the house was leased to Sir Everard Digby, one of the leading conspirators of the plot to blow up the House of Lords and kill King James I. Sir Everard’s wife was waiting anxiously for news at Coughton alongside Father Henry Garnet, the head of the Jesuit mission in England, and Nicholas Owen, the celebrated priest-hole maker. When news arrived that Guy Fawkes had been captured and the plot discovered, the conspirators fled in all directions, most coming to meet a bloody end. We first visited the house in 2015 to make a laser scan of the double-level priest hole. This allowed us to visualise the location of the priest hole in three dimensions in a computer model. Just a few weeks ago we went back for the second stage of the work, with generous funding from The National Trust, to complete the scan of the entire mansion, inside and out. The aim is to create a digital model that will allow visitors to explore and understand the property and its famous ‘secret space’ in more detail, and to allow visitors to explore this hidden space online even if they cannot physically access it. Who knows – the scanning may even reveal more voids and hidden spaces that might conceal further undiscovered priest holes. 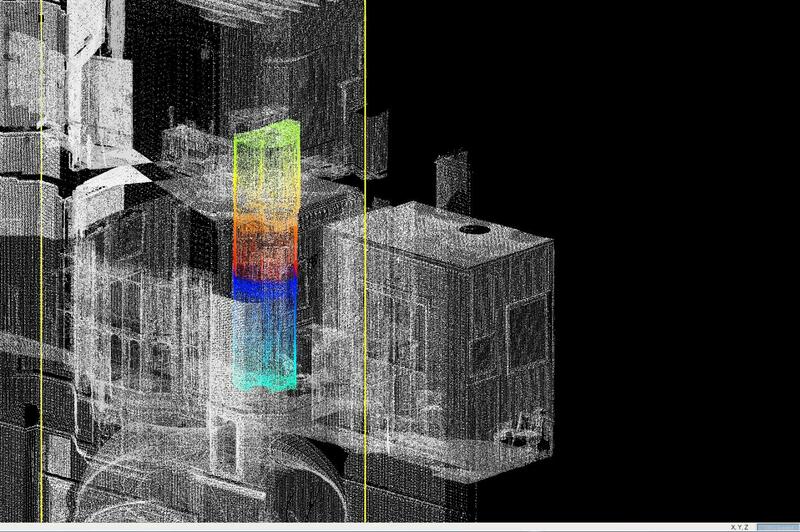 The building survey and laser scanning were completed by Dr Chris King (Department of Archaeology) and Dr Lukasz Bonenberg and Dr Sean Ince (Nottingham Geospatial Institute, School of Engineering) with the help of University of Nottingham students Jennifer Hatton and Joseph Critchley.